Wayne Halfpenny is a member of the England & Scotland Master Thatchers' Association. I have been thatching for twenty five years ever since leaving school. I enjoy thatching and take great pride in my work. I have thatched houses, public houses, summer houses you name it I can probably thatch it. I have thatched all over the country from the North of England to the South of England. I use many materials for thatching including Water Reed, Combed Wheat Straw and Long Straw. 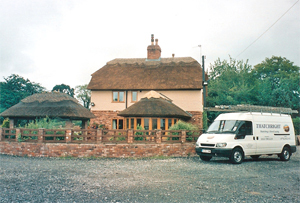 As a well respected Master Thatcher I offer excellent service which is undertaken by myself and my conscientious thatching team. I also offer competitive prices and offer a free quotation. If anybody requires any references with regard to my work I would gladly offer names and addresses of people who I have worked for. I have a number of customers who telephone me all the time if work needs to be done on their properties.